Francis Albert "Frank" Sinatra, (December 12, 1915 – May 14, 1998) was an American singer and film actor of Italian origin. Sinatra forged a highly successful career as a film actor, winning the Academy Award for Best Supporting Actor for his performance in From Here to Eternity, a nomination for Best Actor for The Man with the Golden Arm, and critical acclaim for his performance in The Manchurian Candidate. He also starred in such musicals as High Society, Pal Joey, Guys and Dolls and On the Town. Sinatra was honored at the Kennedy Center Honors in 1983 and was awarded the Presidential Medal of Freedom by Ronald Reagan in 1985 and the Congressional Gold Medal in 1997. 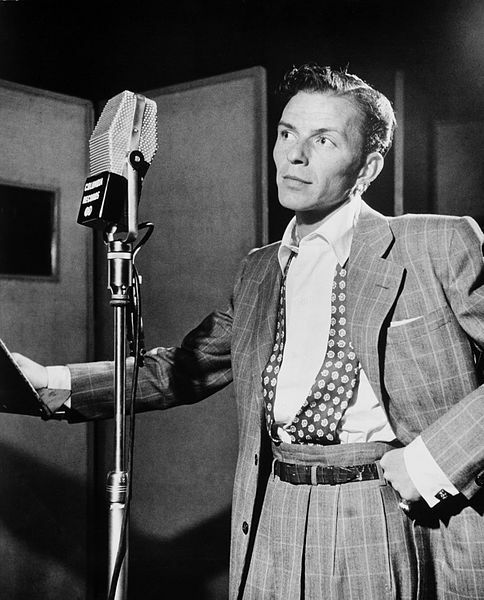 Sinatra was also the recipient of eleven Grammy Awards, including the Grammy Trustees Award, Grammy Legend Award and the Grammy Lifetime Achievement Award. 1098 – First Crusade: Massacre of Ma'arrat al-Numan – Crusaders breach the town's walls and massacre about 20,000 inhabitants. After finding themselves with insufficient food, they resort to cannibalism. 1408 – The Order of the Dragon a monarchical chivalric order is created by Sigismund of Luxembourg, then King of Hungary. 1781 – American Revolutionary War: Second Battle of Ushant – A British fleet led by HMS Victory defeats a French fleet. 1787 – Pennsylvania becomes the second state to ratify the United States Constitution five days after Delaware became the first. 1862 – USS Cairo sinks on the Yazoo River, becoming the first armored ship to be sunk by an electrically detonated mine. 1870 – Joseph H. Rainey of South Carolina becomes the second black U.S. congressman, the first one being Hiram Revels. 1901 – Guglielmo Marconi receives the first transatlantic radio signal at Signal Hill in St John's, Newfoundland. 1918 – Flag of Estonia is raised atop the Pikk Hermann for the first time. 1937 – USS Panay incident: Japanese aircraft bomb and sink US gunboat USS Panay on the Yangtze River in China. 1941 – World War II: USMC F4F "Wildcats" sink the first 4 major Japanese ships off Wake Island. 1942 – A fire in a hostel in St. John's, Newfoundland, kills 100 people. 1958 – Guinea joins the United Nations. 1969 – Strategy of tension: Piazza Fontana bombing – The offices of Banca Nazionale dell'Agricoltura in Piazza Fontana, Milan, are bombed. 1979 – Coup d'état of December Twelfth: South Korean Army Major General Chun Doo-hwan orders the arrest of Army Chief of Staff General Jeong Seung-hwa without authorization from President Choi Kyu-ha, alleging involvement in the assassination of ex-President Park Chung Hee. 1979 – President of Pakistan, Zia-ul-Haq, confers Nishan-e-Imtiaz on Nobel laureate Dr Abdus Salam. 1979 – The unrecognised state of Zimbabwe Rhodesia returns to British control and resumes using the name Southern Rhodesia. 1979 – A major earthquake and tsunami kill 259 people in Colombia. 1983 – the Australian Labor government led by Prime Minister Bob Hawke and Treasurer Paul Keating floated the Australian dollar. 1984 – Maaouiya Ould Sid'Ahmed Taya becomes the third president of Mauritania after a coup d'état against Mohamed Khouna Ould Haidalla while the latter is attending a summit. 1985 – Arrow Air Flight 1285 crashes after takeoff in Gander, Newfoundland, killing 256, including 236 members of the United States Army's 101st Airborne Division. 1988 – The Clapham Junction rail crash kills thirty-five and injures hundreds after two collisions of three commuter trains – one of the worst train crashes in the United Kingdom. 1991 – Russian Federation gains independence from the USSR.